Later edit: I was notified that some of the video links weren't working. I think they all are now, but please do notify me if any of them don't? 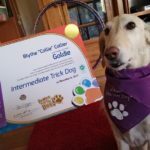 Yesterday I bragged on Goldie's Novice Trick Dog title, so today I'd like to share some of her awesome work on her Intermediate and Advanced titles! To receive the titles a dog has to successfully perform 15 tricks for the Novice, 15 more for the Intermediate, and then five more difficult tricks for the Advanced, and five tough ones for the Expert. 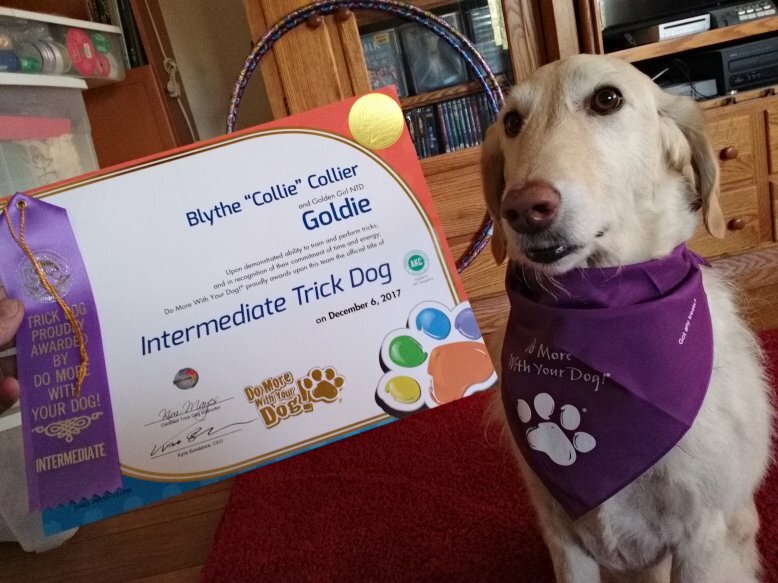 Goldie in her spiffy new purple DMWYD bandanna & her ITD certificate! So here's Goldie doing some of the tricks required for her Intermediate Trick Dog certificate. The first one is visually not very exciting, but takes quite a bit of training: Goldie puts her paws up on a target, then circles her rump end around so she stays standing next to me. Very proud of how well she got that one! Next is her doing a "Have you been naughty?" with the rug on the floor, followed by a leg weave, and then a "play dead" followed by a "miraculous" revival — though Goldie seems to be the happiest "dead" dog I've ever seen! :) Finally we do a roll-over in both directions. While Goldie eventually did successfully perform the shell trick, I've included a blooper reel of her getting too excited while practicing — to the point that she simply shoves an offending "shell" right off the bench! So that's some of the Intermediate tricks. Here's a few of the Advanced tricks: a very nice paw cross and some good "touch your button" work. The last video is where Goldie & I do some distance work at 10' or more ("crate" followed by down), then she performs backing up. I'll add in a photo of the Advanced Trick Dog Certificate as soon as it arrives!